Ditch the burpees and forget the fad diets, here are some epic active adventures that you (and your fitness tracker) will actually enjoy. From chasing waterfalls to climbing mountains and everything in between, you’ll be clocking up the steps and taking in the best that nature has to offer with these holiday activities. Top tips: Tackle Castle Hill in the early morning or late afternoon to beat the heat. Take water and don’t forget the camera – you’ll want photos at the top. When more than 2,500 locals venture up Castle Hill daily, you know the view at the top will be worth the climb. Start from Gregory Street, near Townsville City and walk along the road to the top or if you’re feeling a little more adventurous, explore one of the many dirt trails. Either way once you get to the peak you’ll be rewarded with 360° views of Townsville and across to Magnetic Island. Top tips: Catch a transfer from Lucinda and be prepared to live completely self-sufficient for four days. This is a grade 5 hike, so make sure you’re well trained to tackle this one! Ok, so you won’t find a dinosaur breeding program here, but Hinchinbrook Island will have you feeling like you’ve stepped back into a prehistoric time! With epic mountainous terrain, meandering creeks and stunning waterfalls, it’s no wonder the Thorseborne Trail on Hinchinbrook Island is considered world-class, and the best hiking experience in Queensland (as voted by the people who know best – Queensland Parks and Wildlife). So, lace up the hiking boots and prepare for four days of exploring the spectacular wilderness of Hinchinbrook Island. With only 40 permits allowed at any one time, you’ll most likely have the entire place to yourself. Top Tips: The drive to Wallaman Falls from Townsville is approximately two hours. Leave early to beat the heat. If you think you’ve seen big waterfalls, you haven’t seen anything like Wallaman Falls. You can take the easy option and enjoy the beauty from the lookout, but if you really want to get the best views you’ll want to venture to the base via the 2km trail. As you walk amongst the rainforest the roar of the falls will gradually get louder. Eventually the twisty path will lead you to a sight that can only be described as jaw-dropping – look up and witness crystal clear water tumbling a spectacular 268 metres. Top Tips: If you see sticks on the ground in the shape of an arrow, chances are it’ll be pointing in the direction of a recently sighted koala. Locals leave these markers to make koala sighting easy for everyone. What do you get when you combine WWII history with stunning ocean vistas and regular sightings of koalas? The Forts Walk on Magnetic Island! Magnetic Island has the largest colony of koalas in Northern Australia and the best location to spot these resident locals is on the spectacular Forts Walk. 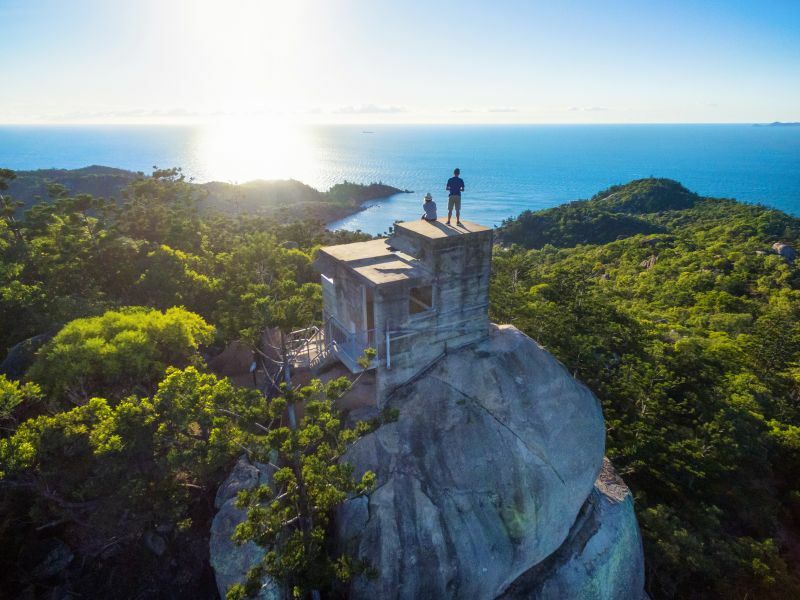 On this walk you’ll also be awarded with some of Magnetic Island’s best views and fascinating WWII fortifications, this is one not to miss! Want to really stretch out the legs and hit the pavement for a run? Well, you’re in luck because Townsville has some amazing running paths – perfect for everyone from the weekend warrior to the marathoner. The Strand, Townsville’s stunning beachfront, offers 2.5km of flat, fast and breezy footpath, perfect for that PB run. If you’re looking for something a bit longer, head out on the linking path to the end of Pallarenda, where you’ll be able to easily clock up 21km return. If you want to challenge yourself and meet some of the local running talent why not join one of Townsville’s two park run courses on a Saturday morning. Located at Riverway and Northshore, these 5km timed runs are the perfect way to kick start an active weekend and holiday! If pavements and footpaths aren’t your style, hit the trails at Pallarenda or Douglas for an off-road running (or mountain biking) experience. Are you ready to take on the wilderness walk of a lifetime?